Avec Nous — the contemporary take on the classic French bistro with a St. Tropez vibe, is ready for the day of lovers with their Mediterranean-inspiried dishes. Spanish and Italian touches compliment their Riviera feel, and diners can expect a dosage of European spices to accompany their locally sourced seasonal ingredients. What’s in store for Avec Nous’ Valentine’s Day specials? A refined yet inviting dining experience featuring a 5 course tasting menu (and optional wine pairing), with appetizers like Lobster Raviolo, Armagnac Cream, and Chili-Chive Espuma; while the entrees include a choice of Seared Scallops, Sweet Potato Purée, Roasted Brussel Sprouts, and Candied Pork Belly. You can view Avec Nous’ entire Valentine’s Day 5 course menu here. Reserve now, as it’s likely to be a full house. In their own words, “Our passion is defined by our name: Avec Nous – dine with us, drink with us, celebrate with us.” Celebrate your love with Ave Nous! Category: 5 course tasting menu with optional wine pairing. When you see what Cast at Viceroy is, and what it has to offer, you’ll most likely be reminded of a movie that features scenes of a luxurious dining experience. Creative food, hand-crafted cocktails, and stylish outdoor cabanas where you can enjoy both, with a side of coastal personality? That should be enough to persuade you into making a reservation, right? If not, maybe you’re picky, but don’t fret. Roasted Tomato & Fennel Bisque, Grilled Little Gem Salad, and the Baby Beet & Burrata Salad are just a few starters to get you all warmed up. Entrees include Branzino, Maine Lobster and Tagliatelle, and Farro Risotto to name a few. You can check out the rest of Cast’s Valentine’s Day offerings here, along with photos of the cocktails available for the lover’s holiday. 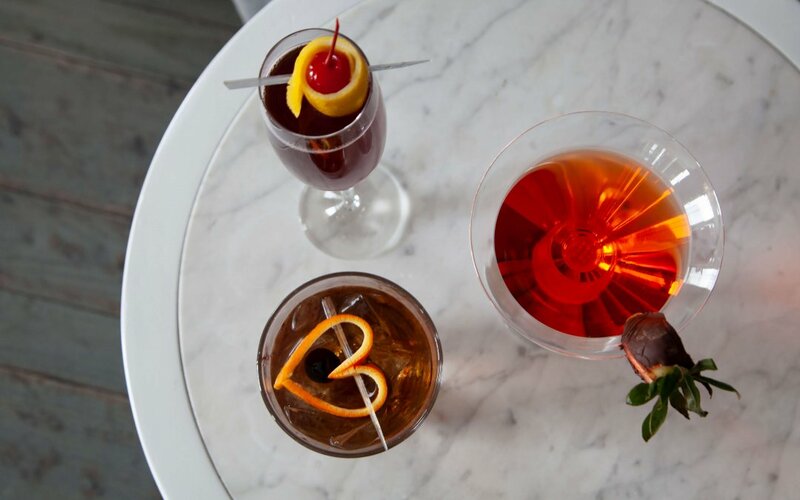 The cocktails by Anuar Chavez, are as dreamy as you can imagine, with chocolates, fruits, and liqueurs — yet their names alone should be enough to entice you: Old Fashioned Love, Cherries on Top/Bubbles on Cherries, and Chocolate Covered Strawberry. Are you convinced yet? If the answer is “yes,” make your reservation. If you’re still not sure, don’t worry. We’ve still got a few more stops to make. The name is clearly an indication that Valentine’s Day should be celebrated here! Love & Salt’s Valentine plans include you and your date, along with a special menu themed “Is it love or lust?” What’s in store? Pasta tasting is being offered as a supplement to the Love & Salt dinner menu, and served by the course to each guest. In addition, themed cocktails and oysters on the half shell are available a la carte. Pasta tasting options include Papparadelle, Potato Gnocchi, 15 layer Lasagna, and Love Letter. Love & Salt’s steamy cocktails, named “Lady in the Ballroom” and “Lady in Red,” will seal your night with a kiss of citrus and mint. “Love & Salt is a story that begins with Cafe Pierre, a restaurant birthed by Guy Gabriele in 1977 to bring a taste of France to Los Angeles’ South Bay. While Cafe Pierre was a beloved part of the community for nearly 37 years, in 2014, Guy and his daughter Sylvie Gabriele, now the owner of Love & Salt, closed the restaurant to bring new life to the iconic space. Southern dining meets love at Yardbird, and it couldn’t get any better! Yardbird’s Valentine’s Day offerings consist of elevated comfort food, including appetizers, entrees, “finishing touches,” and desserts. Black truffle lobster mac and cheese, grouper, steak, sea scallops, and red velvet coconut cake are only a few of the impossibly difficult choices you’ll have to make when you reserve at Yardbird. Burgers can be romantic too! In our final stop you’ll see why, like a cute Valentine’s Day couple, Umami Burger’s latest partnership with Coolhaus will have you and your Valentine swooning! Umami Burger has partnered with Coolhaus this Valentine’s season to bring a special in-restaurant offer to the lover’s — and even those who aren’t! From February 11 through the 17th, when you order free delivery from DoorDash, Postmates, or Caviar (at a $15 minimum/order), you’ll receive an in-restaurant offer to redeem at a participating Umami Burger location on your next visit! Any purchase of a burger or salad means guests are eligible to receive 1 complimentary Coolhaus sandwich of their choice. (Limit one per voucher. Not valid to combine with other offers or promotions. Offer expires after February 28, 2019). Also, for those redeeming their free Coolhaus sammie, receive an additional $1 off coupon valid for any Coolhaus Pint at a Whole Foods nearest you (in SoCal and NorCal only). Clearly, this holiday was made for pairings, and that includes dinner choices and drinks. Now that you’ve got a great list of potential places to romantically grub out, there’s no excuse for disappointing your Valentine this year. Still, make sure you find an equally amazing gift for your love!